Last month, several powerful storms hit California, causing widespread flooding in both Northern and Southern California. The storms caused multiple rivers to flood in Northern California, including the Russian River in Sonoma County. Southern California experienced record-breaking rainfall in many places, including the Los Angeles Airport. Throughout the state, the storms prompted evacuations, forced thousands to flee their homes, caused mudslides and rockslides, knocked down power lines, uprooted trees, and flooded roads and freeways causing numerous accidents. At least eight people died. Many of the damages from the storms will likely be covered losses under homeowners’ and commercial insurance policies. These storms were atmospheric rivers (ARs). This is a weather phenomenon consisting of water vapor forming over the ocean and being transported in long and relatively narrow regions of the atmosphere (on average 400-600 km wide). ARs can create extreme rainfall and major flooding when they make landfall over an area. According to the National Oceanic and Atmospheric Administration’s Earth System Research Laboratory, a strong AR can transport an amount of water vapor equal to up to 15 times the average flow of water at the mouth of the Mississippi River. In the Golden State, ARs have been responsible for numerous winter storms and multiple floods over the last two decades. 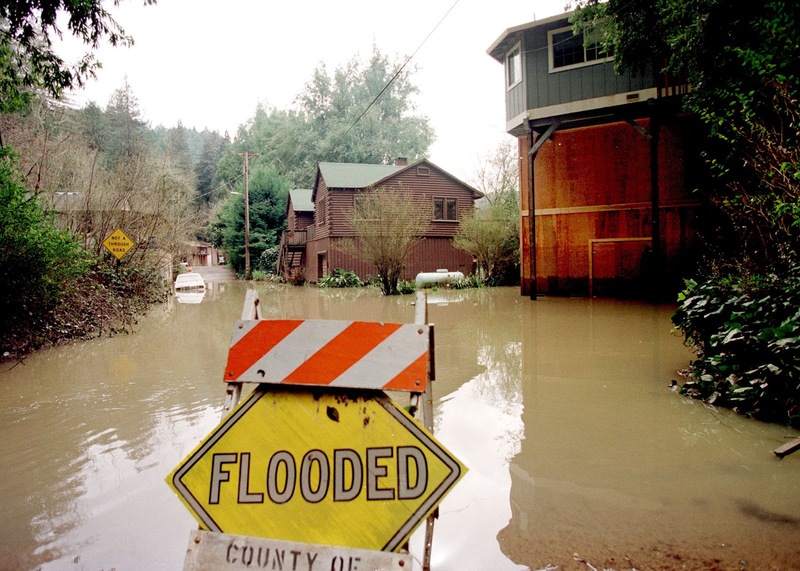 For example, from late December 1996 to early January 1997, a Pineapple Express struck Northern California, causing a major flood that became known as the “New Year’s Day Flood,” and resulted in over $1 billion in damages. ARs are therefore very significant events for the insurance industry. While ARs can lead to devastating floods, the precipitation they cause is critical to California’s water supply. In addition to heavy rain, last month’s winter storms also brought blizzard conditions in parts of the Sierra Nevada mountain range in Northern California, and significantly increased its snowpack, a key source of water for the state. These ARs have helped alleviate California’s six-year drought conditions – about 18% of the state is now free of drought. ARs can now be forecasted. The National Weather Service has techniques that can identify these phenomena and give advance warnings of their presence, 5 to 7 days before the ARs make landfall. Additionally, scientists within the ESRL have developed AR observatories along the west coast, to monitor ARs and improve our understanding of them. It is expected that these advances will help to mitigate the risk of major flood events, and at the same time improve water management decisions in California and the other western states. Nevertheless, experts are concerned that, as a result of climate change, ARs are projected to become more frequent and intense. This can result in major insured losses in the west coast. The United States Geological Survey, Multi Hazards Demonstration Project, has developed a megastorm scenario called “ARkStorm” (for Atmospheric River 1000 Storm), studying the catastrophic impact of a series of extreme ARs in California. We will discuss this scenario, referred to by the USGS as “California’s other ‘Big One,’” in an upcoming post.